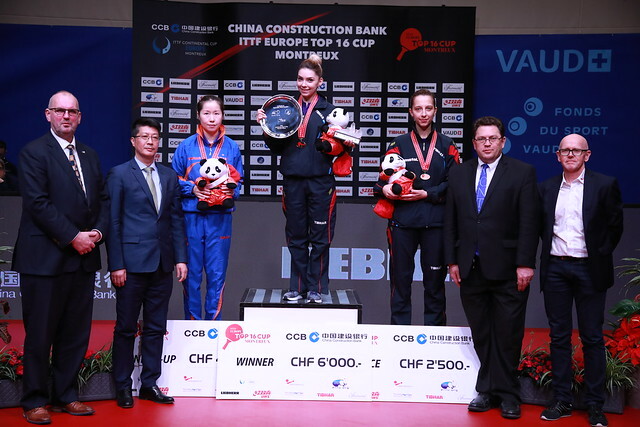 Crowned champions in French Riviera earlier in the year during the first week of February, Germany’s Dimitrij Ovtcharov and Li Jie of the Netherlands, defend their hard earned titles at the forthcoming China Construction Bank 2018 ITTF Europe Top 16 Cup. Play takes place in the Omnisport du Pierrier on Saturday 3rd and Sunday 4th February. However, the two star names will be defending their titles in a tournament that has stood the test of time but is witnessing yet another change. For the first time in each of the Men’s Singles and Women’s Singles events, play will be conducted on the knock-out basis from start to finish; there will be a play-off contest to determine third position. Players finishing in the first three positions in each event will qualify for the respective Men’s World Cup and Women’s World Cup tournaments to be held later in the year. First staged in 1971 in Zadar, Croatia; on that occasion the tournament was to some extent a classification event; the age of computer ranking was for two decades later, committee opinion was order of status criteria. A total of 12 men and six competed with Hungary’s Istvan Jonyer and Beatrix Kishazi emerging the winners. A success, the tournament assumed the name “The Europe Top 12”; the format being the classical all-play-all itinerary; overall 11 matches, each match best of five games, each game to 21 points. Held on an annual basis, the same format was maintained until 1989 in Charleroi when Sweden’s Jan-Ove Waldner and Olga Nemes, then representing Germany, emerged victorious. One year later in 1990, there was the first of what was to prove several changes; organised in Hannover, play took place in two stages. The first stage witnessed players competing in two groups each with six players; players finishing in first and second places in each group progressed to the semi-finals. Sweden’s Mikael Appelgren and Hungary’s Gabriela Wirth emerged the champions; there was a play-off for third place. Players who finished in the third position in the first phase groups were named in equal fifth place, fourth position in seven place, fifth in ninth place and six in joint eleventh. The system continued until 2001 in Wels, the only change being that from 1993 in Copenhagen, there was no play-off for third position. In 2001 the first stage was changed to four groups, three players per group, first and second in each group progressing to the quarter-finals; there was no play-off for third place. Players losing at the quarter-final stage, shared fifth position; those failing to progress from the group stage were listed in joint ninth position. Later in 2014 in Lausanne, when the tournament had become a qualification for the Men’s World Cup and Women’s World Cup, the play-off for third place was re-introduced as it was for the positions five to eight. However, the year 2014 was to witness the last of the “Europe Top 12”, the following year in Baku it became the “Europe Top 16”; the one difference to the previous year being that the first stage group comprised four players, each playing best of five games. The second stage was best of seven games. Now in Montreux, there is no room for error; they do say the first match in a tournament can be the most difficult. Could there be opening round upsets? Dimitrij Ovtcharov and Li Jie beware!